The copy of an unknown deed of gift dating from the second or third decade of the 12th century discovered in the archives of St. Peter’s Chapter has increased our knowledge of a number of ancient possessions in the Collinese area to the north of Rome owned by the monastery of Ss. Andrea e Gregorio ad Clivum Scauri. The critical edition of the document is published as an appendix to the essay. Manuscript Vat. Lat. 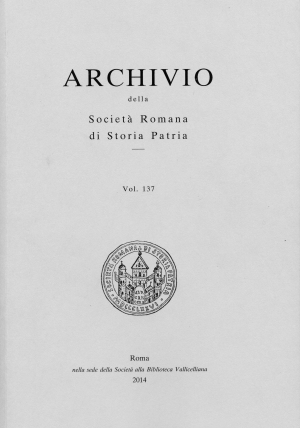 3993 in the Vatican Library contains a collection of briefs written by Poggio Bracciolini, the papal secretary of Nicholas V. Thanks to the content, recipients (sovereigns, bishops, civil authorities) and perfection of composition this collection of documents is of great interest. The whole career of Cardinal Ottavio Paravicino (1552-1611) took place within the Roman Curia. Art historians are aware of him thanks to a controversial letter he wrote about the works of Cara-vaggio but he is also worthy of consideration because of the artworks he commissioned and the way in which he promoted his own family’s name and social standing. Sant’Andrea de scaphis, a deconsecrated church in Trastevere, is well-known from many me-diaeval and renaissance manuscript sources. This essay relates the history of the building and of people connected with it. The essay gives an account of the presence and activities in Palazzo Madama of 45 members of the Upper Chamber, all born in Rome, during the 52 years in question (1870-1922). Somewhat less than half of these men (21) were appointed in accordance with category XXI of the Statutes, i.e. thanks to their wealth. Only a few enjoyed positions of political importance: these were the Ministers Tommaso Tittoni, Alfredo Baccelli, Camillo Corsi and Domenico Grandi, and Frances-co Nobili Vitelleschi, one of the members of the Giunta d’inchiesta agraria (Board of Enquiry in-to the Conditions of the Agricultural Class).